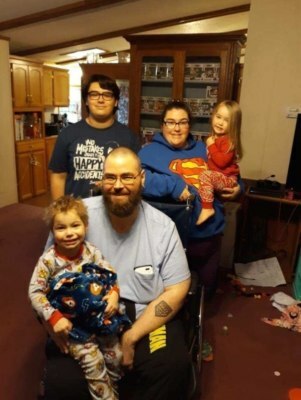 This year’s Valentine’s Day promises to be better than last year for 38-year-old John Webster and his young family of Grand Rapids, Mich. After recovering from a massive stroke and nearly a year in rehab, John is returning home in mid-January to once again help care for his family – including two young children. At SKLD Beltline where he spent the last eight months, John worked with therapists to learn how to compensate for the left side of his body that was paralyzed by his stroke. In addition, being a father to young children meant that John had to focus on standing for long periods of time to perform fine motor skills with one hand—such as changing a diaper or preparing food. Gait training was a little unusual, focusing a lot on obstacles on the floor because anyone with little kids knows that there is always something strewn across the floor to trip over. What actually happened was that John had a hemorrhage on right side of brain, leaving the left side of body affected. His leg gave out and when he tried to life himself up, he couldn’t use his left arm. John was rushed to Metro Health, the job he had just left, where he was placed under a medically induced coma for a week. John spent most of this past year at SKLD Beltline, learning how to walk again and maneuver with only one arm. Although John is young, he had high blood pressure and sleep apnea, both of which are risk factors for a stroke or heart attack. John Webster, pictured with his therapy team at SKLD Beltline. February is American Heart Health Month, sponsored by the American Heart Association to raise awareness and help prevent heart disease. A stroke is caused by an interruption or reduction of the blood supply to part of the brain, depriving brain tissue of oxygen and causing brain cells to die. Early action is crucial to a victim’s chance of survival and level of recovery. A stroke is a risk factor for coronary heart disease, and both coronary heart disease and stroke share many of the same risk factors. After spending a month at one rehabilitation facility in the Grand Rapids area, John was transferred to SKLD Beltline in order to receive more advanced therapy. 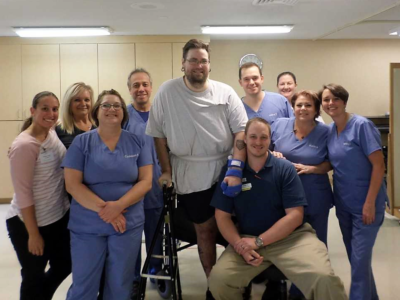 With little use of his left arm or leg, John went from learning how to transfer from the bed to a wheel chair using a slide board to learning to stand and then eventually walk again. Jason Toma recalls that standing for the first time for 20 seconds left John exhausted in bed for the remainder of the day. “I slowly worked from a knee brace to a walker and now a cane. I’m just trying to go a little farther each time,” says John.